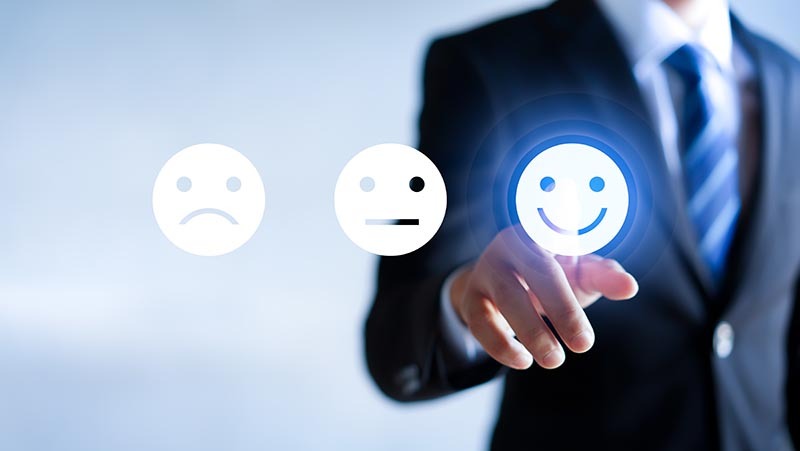 Defining the B2B customer experience - what do commercial banking customers really want? Commercial banking is still taking too long to catch up to the consumer banking experience, our recent market analysis suggests. 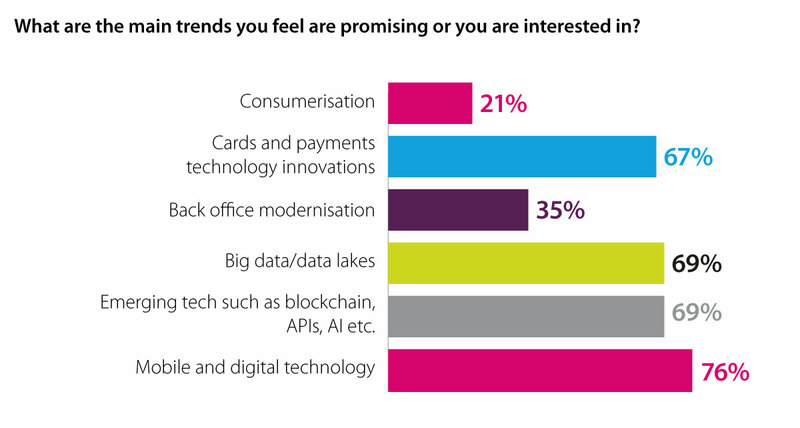 Two-thirds of respondents, working in both the retail and commercial sectors, believed that commercial banking was lagging its retail counterparts when it came to innovation and adoption of new technologies. There’s obviously demand in the market for change. In our recent white paper, we found that 95% of commercial clients who bank digitally in their personal lives now expect to bank digitally for business as well. But it seems that commercial banks are slow to address this issue – and worryingly so. Why have commercial banks historically been resistant to innovation? 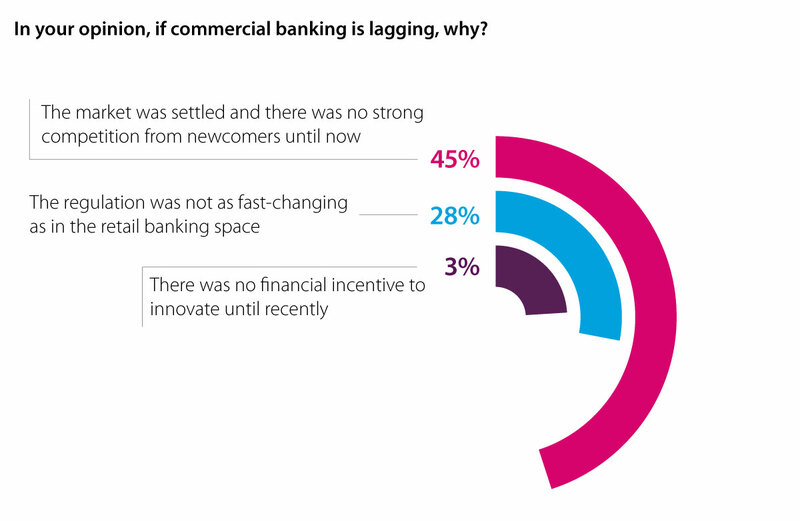 When asked why they thought commercial banking was lagging, 45% of survey respondents believed that, until recently, the market was settled and faced no strong competition. A further 28% felt that there was no financial incentive to innovate. This suggests the same blinkered attitude that saw challenger banks steal the march on innovation in the consumer space. Is history repeating itself? Commercial banking executives are beginning to see a more immediate need to build on customer experience in the B2B sector. 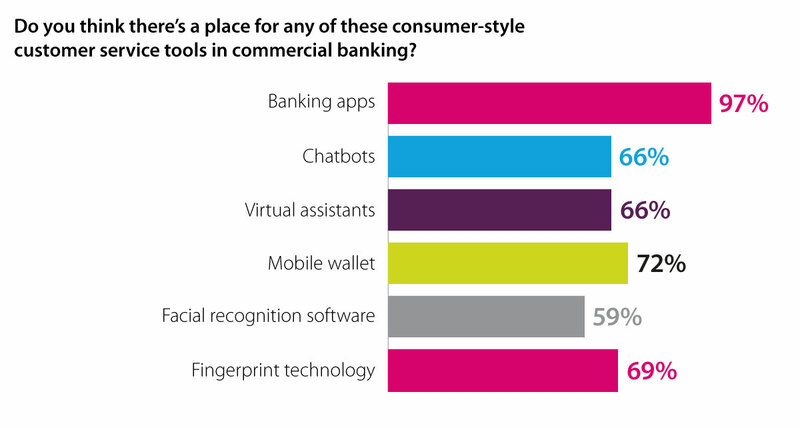 Interesting to note that most of our survey respondents selected multiple answers when asked if they saw a place for any consumer-style tools in the commercial banking space. This suggests that banks are not focusing their efforts solely on one piece of innovative technology. A blended approach to innovation seems to be preferred. Almost everyone (97%) can see the virtue of providing commercial banking apps, while 72% would extend that capability to mobile wallets. Seamlessness is key. In our previous research, we discovered that 95% of commercial banking clients wanted their providers to supply the same aggregated account views and real-time transactional information that their personal apps did. They also wanted the same seamless access to accounts. Security had been a roadblock to this. But in our survey, 69% of respondents believe fingerprint technology and biometric tools are very much on the shopping list. That’s not to say everyone is fully committed to cutting-edge options. Fewer respondents were keen on facial recognition software, for example, but overall it was still a healthy 59% who could see a need for it. Commercial customers may be selfie-paying in the future. We live in an always-on world. Even if local markets aren’t making demands outside office hours, international commerce, practiced by even the smallest kitchen table entrepreneur, means clients need banking facilities and support 24/7. This need to be responsive to clients is also well-supported by our survey. While our paper found that 71% of customers prioritised account management and customer service, the survey revealed that 66% of banking professionals felt chatbots and virtual assistants would help them achieve their customer experience goals. 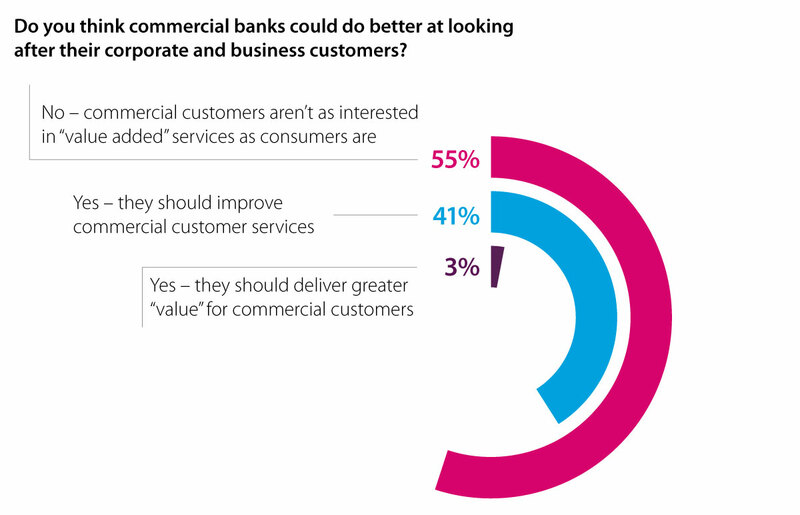 However they plan to achieve it, commercial banks recognise the need to improve their customer service strategies (41%). Many more believe it’s important to be delivering better value (55%). This can prove dangerous as ‘value’ is a subjective term. Most commercial customers define value as a monetary benefit. The white paper reveals that clients are under as much margin pressure as ever with 60% looking for savings wherever they can find them, an increase of 3% since 2016. A focus on cost savings doesn’t mean commercial banking clients are conservative. A further 60% stated they weren’t as risk-averse as they used to be and managing risk as a priority for businesses fell 21% since 2016. The banks’ clients want to be able to move quickly, make decisions fast and have financial tools that support a more agile, fail fast - learn fast culture. Value also means a banking partner who supports the whole of their clients’ process, from accessibility to financial instruments, delivering control over financial reporting and transparency that lets them make decisions quickly and accurately. Where should commercial banks prioritise their efforts? To deliver value, investment in mobile and digital technology continues to dominate executives’ interests (76%). Emerging technology is also beginning to look interesting to many respondents (69%). For example, artificial intelligence might be making headlines, but practical applications are few and far between in commercial banking in 2018. APIs are also making waves, with rapid uptake in the consumer sector due to Open Banking. The ‘plug and play’ potential of APIs to deliver new products and services to clients are attractive to commercial banks that don’t want to develop proprietary products in-house, because such projects are too expensive and too time-consuming to deliver value quickly enough to the end user. Card and Payments technologies are going to be key in supporting the agile commercial banking customer and it’s encouraging to see that 66% of commercial banks are looking to exploit the trend. Commercial cards and digital payments solutions are shaking up procurement practices with access to real time expenditure data, helping CFOs introduce spending efficiency and improve working capital management. Clients are actively looking for solutions to support improved purchasing strategies and will favour banks that can provide them. It’s unsurprising that data is a strong focus for commercial banks (69%), given how much it underpins the above trends. This contrasts with only 34% of executives interested in modernising their back-office operations. You can’t throw a stone in the commercial banking space without hitting an executive who claims they could do more with data (69% interested in this trend) and digital if only they didn’t have to deal with their legacy systems. But without clean data and integrated systems, any digital innovation is doomed to failure. It might be worrying to see that so few executives are concerned with improving or putting back office solutions in place to deliver value to their customers. That is until you delve further into the results of our survey. In fact, there is a distinct trend among survey respondents showing that they do plan on improving their technological response to customer needs, with 62% planning to increase investment and research and development in new technologies. But, even more importantly, 66% also plan on entering into collaborations with fintechs. 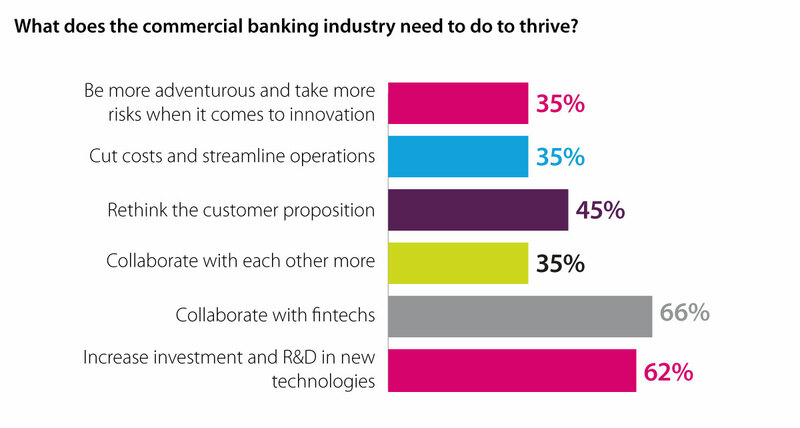 How can commercial banks access the expertise needed to innovate? Collaboration like this is important for several reasons. First, as we’ve mentioned above, developing new digital capabilities in-house for commercial banks with decades of legacy systems is both too expensive and time-consuming. Second, the market changes quickly. What may be a core fintech partnership to a commercial bank today may become peripheral in five years’ time. Partnerships, therefore, allow commercial banks to mix and match providers according to need. Building internal capability is a permanent commitment and one at high risk of at least partial obsolescence, even in the near term. If you want to know how commercial banks are making the most of their fintech partnerships and where the opportunities are to use them to further benefit, read Creating the B2B customer experience: are fintech partners the answer?